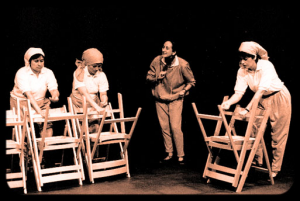 “Crossing Borders” (presented at the Popular Theatre Festival, Edmonton 1991). “I wasn’t born here” (presented at the Popular Theatre Festival, Guelph, 1989). 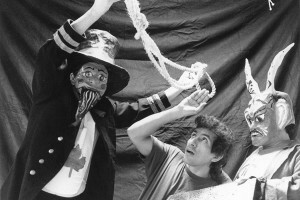 “Pastorela de Juan Tierra, el inmigrante” (by Jaime Silva, presented at the 1er Festival Hispanoamericano de Pastorelas in Mexico City, 1999). “Twelfth Night”“ (Shakespeare /Leon Felipe); “Commedia dell’Arte” (Shakespeare Festival); “Mother Courage” (Bertold Brecht); “The House of Bernarda Alba” (F.Garcia Lorca); “Happy Days” (Samuel Beckett); “O Best beloved” (Rudyard Kipling, adapt. by Ralph Cole)); “Show Boat”; “The secret obscenities of each day” (Marco Antonio de la Parra). “Formations”, “Transitions”, “A different mirror”.